Should Coast Guard Be Held Responsible in Boating Accidents? 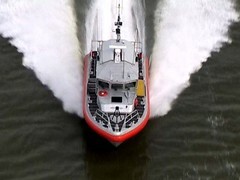 Eyewitnesses spoke of the speed of the Coast Guard boat immediately after the accident. “The real blame for this accident lies higher up with the Coast Guard for a lack of supervision, lack of training, lack of command and control, the failure to clearly point out in their training manual that there’s a distinct lack of visibility in these boats,” Neil said.